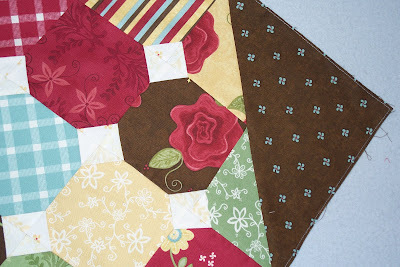 I wrote in a previous post about some Fabric, Rebel Roses, that I won in Heather Mulder Peterson's blog giveaway. A layer cake yields a lot of projects, I am finding. 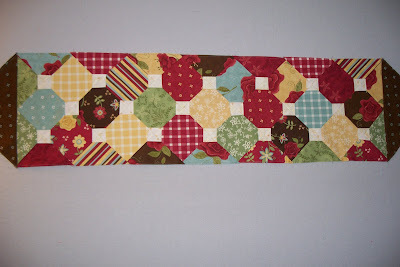 I made the table topper in the previous post and I also made this table runner out of one of Heather's Little Charmers patterns. One of the reasons I like her patterns is that they have simple directions with great shortcuts. This pattern tells you which way to iron everything and by doing that you get those perfect intersections. The pattern calls for applique on the triangle ends but I think this brown fabric is cute and I'm going to leave it as is. I love her combination of colors and I have enough fabric for a couple more table runners so I'll be tackling those at some point, probably for Christmas presents. Make sure you check out Heather's blog and read about the amazing house renovation she and her husband have undertaken. Is that a hint dear daughter? Glad to hear you are making great use of that fabric bundle! What a pretty pretty addition to your home. Or, maybe to Caryl's table. I think it's a great hint, hint, hint. I'm on board! I love Heather's fabrics and patterns, too. 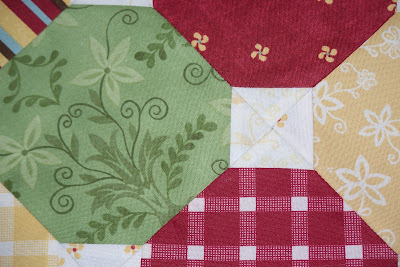 The table runner looks great, and I agree with you that the corners don't need applique'.